This article is about the rail vehicle. For the American rock band, see Train (band). For the act of teaching or developing skills or knowledge, see Training. For other uses, see Train (disambiguation). A train is a form of transport consisting of a series of connected vehicles that generally runs along a rail track to transport cargo or passengers. The word "train" comes from the Old French trahiner, derived from the Latin trahere meaning "to pull" or "to draw". Motive power for a train is provided by a separate locomotive or individual motors in a self-propelled multiple unit. Although historically steam propulsion dominated, the most common types of locomotive are diesel and electric, the latter supplied by overhead wires or additional rails. Trains can also be hauled by horses, pulled by engine or water-driven cable or wire winch, run downhill using gravity, or powered by pneumatics, gas turbines or batteries. Train tracks usually consist of two running rails, sometimes supplemented by additional rails such as electric conducting rails and rack rails. Monorails and maglev guideways are also used occasionally. A passenger train includes passenger-carrying vehicles and can often be very long and fast. One notable and growing long-distance train category is high-speed rail. In order to achieve much faster operation at speeds of over 500 km/h (310 mph), innovative maglev technology has been the subject of research for many years. The term "light rail" is sometimes used to refer to a modern tram system, but it may also mean an intermediate form between a tram and a train, similar to a heavy rail rapid transit system. In most countries, the distinction between a tramway and a railway is precise and defined in law. A freight train (or goods train) uses freight cars (or wagons/trucks) to transport goods or materials (cargo). It is possible to carry passengers and freight in the same train using a mixed consist. Rail cars and machinery that are used for the maintenance and repair of tracks, are termed "maintenance of way" equipment; these may be assembled into maintenance of way trains. Similarly, dedicated trains may be used to provide support services to stations along a train line, such as garbage or revenue collection. There are various types of train that are designed for particular purposes. A train can consist of a combination of one or more locomotives and attached railroad cars, or a self-propelled multiple unit, or occasionally a single or articulated powered coach called a railcar. Special kinds of train running on corresponding purpose-built "railways" are monorails, high-speed railways, maglev, atmospheric railways, rubber-tired underground, funicular and cog railways. A passenger train consists of one or more locomotives and (usually) several coaches. Alternatively, a train may consist entirely of passenger-carrying coaches, some or all of which are powered; this is known as a "multiple unit". In many parts of the world, particularly the Far East and Europe, high-speed rail is used extensively for passenger travel. 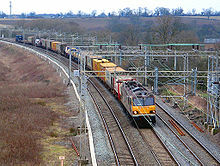 Freight trains consist of wagons or trucks rather than carriages, though some parcel and mail trains (especially Travelling Post Offices) appear outwardly to be more like passenger trains. Trains can also have mixed consist, with both passenger accommodation and freight vehicles. These mixed trains are most likely to be used for services that run infrequently, where the provision of separate passenger and freight trains would not be cost-effective, but the disparate needs of passengers and freight means that this is avoided where possible. Special trains are also used for track maintenance; in some places, this is called "maintenance of way". In the United Kingdom, a train hauled using two locomotives is known as a "double-headed" train. In Canada and the United States, it is quite common for a long freight train to be headed by three or more locomotives. A train with a locomotive attached at both ends is described as "top and tailed", this practice typically being used when there are no reversing facilities available. Where a second locomotive is attached temporarily to assist a train when ascending steep banks or gradients (or to provide braking power for a descent), this is referred to as "banking" in the UK. Many loaded trains in the US are assembled using one or more locomotives in the middle or at the rear of the train, which are then operated remotely from the lead cab. This is referred to as "DP" or "Distributed Power." The railway terminology that is used to describe a train varies between countries. In the United Kingdom, the interchangeable terms set and unit are used to refer to a group of permanently or semi-permanently coupled vehicles, such as those of a multiple unit. While when referring to a train made up of a variety of vehicles, or of several sets/units, the term formation is used. (Although the UK public and media often forgo formation, for simply train.) The word rake is also used for a group of coaches or wagons. b) a locomotive not coupled to any other rolling stock. In the United States, the term consist (/ˈkɒnsɪst/ KON-sist) is used to describe the group of rail vehicles that make up a train. When referring to motive power, consist refers to the group of locomotives powering the train. Similarly, the term trainset refers to a group of rolling stock that is permanently or semi-permanently coupled together to form a unified set of equipment (the term is most often applied to passenger train configurations). There are three types of locomotive: electric, diesel and steam. The Atchison, Topeka and Santa Fe Railway's 1948 operating rules define a train as: "An engine or more than one engine coupled, with or without cars, displaying markers." A bogie (/ˈboʊɡi/ BOH-ghee) is a wheeled wagon or trolley. In mechanics terms, a bogie is a chassis or framework carrying wheels, attached to a vehicle. It can be fixed in place, as on a cargo truck, mounted on a swivel, as on a railway carriage or locomotive, or sprung as in the suspension of a caterpillar tracked vehicle. Usually, two bogies are fitted to each carriage, wagon or locomotive, one at each end. An alternate configuration, which is often used in articulated vehicles, places the bogies (often Jacobs bogies) under the connection between the carriages or wagons. Most bogies have two axles, as this is the simplest design, but some cars designed for extremely heavy loads have been built with up to five axles per bogie. Heavy-duty cars may have more than two bogies using span bolsters to equalize the load and connect the bogies to the cars. Usually, the train floor is at a level above the bogies, but the floor of the car may be lower between bogies, such as for a double decker train to increase interior space while staying within height restrictions, or in easy-access, stepless-entry, low-floor trains. The first trains were rope-hauled, gravity powered or pulled by horses, but from the early 19th century almost all trains were powered by steam locomotives. From the 1910s onwards, steam locomotives began to be replaced with less labor-intensive (and cleaner) diesel and electric locomotives, although these new forms of propulsion were far more complex and expensive than steam power. At about the same time, self-propelled multiple unit vehicles (both diesel and electric) became much more widely used in passenger service. Dieselization of locomotives in day-to-day use was completed in most countries by the 1970s. Steam locomotives are still used in heritage railways which are operated in many countries for the leisure and enthusiast market. Electric traction offers a lower cost per mile of train operation but at a higher initial cost, which can only be justified on high traffic lines. Even though the cost per mile of construction is much higher, electric traction is more viable during operation because diesel import costs are substantially higher. Electric trains receive their current via overhead lines or through a third rail electric system. Lesser used locomotives are: gas turbine locomotive and fuel cell locomotives, which combine the advantage of not needing an electrical system in place, with the advantage of emissionless operation. However, there is a substantial initial cost associated with fuel cell vehicles. A passenger train includes passenger-carrying vehicles and can often be very long and fast. It may be a self-powered multiple unit or railcar, or else a combination of one or more locomotives and one or more unpowered trailers known as coaches, cars or carriages. Passenger trains travel between stations or depots, where passengers may board and disembark. In most cases, passenger trains operate on a fixed schedule and have superior track occupancy rights over freight trains. Unlike freight trains, passenger trains must supply head-end power to each coach for lighting and heating, among other purposes. This can be drawn directly from the locomotive's prime mover (modified for the purpose), or from a separate diesel generator in the locomotive. For passenger service on remote routes where a head-end-equipped locomotive may not always be available, a separate generator van may be used. Oversight of a passenger train is the responsibility of the conductor. He or she is sometimes assisted by other crew members, such as service attendants or porters. During the heyday of North American passenger rail travel, long distance trains carried two conductors: the aforementioned train conductor, and a Pullman conductor, the latter being in charge of sleeping car personnel. Many prestigious passenger train services have been given a specific name, some of which have become famous in literature and fiction. In past years, railroaders often referred to passenger trains as the "varnish", alluding to the bygone days of wooden-bodied coaches with their lustrous exterior finishes and fancy livery. "Blocking the varnish" meant a slow-moving freight train was obstructing a fast passenger train, causing delays. Some passenger trains, both long distance and short distance, may use bi-level (double-decker) cars to carry more passengers per train. Car design and the general safety of passenger trains have dramatically evolved over time, making travel by rail remarkably safe. Long-distance trains travel between many cities and/or regions of a country, and sometimes cross several countries. They often have a dining car or restaurant car to allow passengers to have a meal during the course of their journey. Trains travelling overnight may also have sleeping cars. Currently much of travel on these distances of over 500 miles (800 km) is done by air in many countries but in others long-distance travel by rail is a popular or the only cheap way to travel long distances. One notable and growing long-distance train category is high-speed rail. Generally, high speed rail runs at speeds above 200 km/h (120 mph) and often operates on dedicated track that is surveyed and prepared to accommodate high speeds. Japan's Shinkansen popularly known as ("bullet-train") commenced operation in 1964, and was the first successful example of a high speed passenger rail system. The fastest wheeled train running on rails is France's TGV (Train à Grande Vitesse, literally "high speed train"), which achieved a speed of 574.8 km/h (357.2 mph), twice the takeoff speed of a Boeing 727 jetliner, under test conditions in 2007. The highest speed currently attained in scheduled revenue operation is 350 km/h (220 mph) on the Beijing–Tianjin Intercity Rail and Wuhan–Guangzhou High-Speed Railway systems in China. The TGV runs at a maximum revenue speed of 300–320 km/h (190–200 mph), as does Germany's Inter-City Express and Spain's AVE (Alta Velocidad Española). In most cases, high-speed rail travel is time- and cost-competitive with air travel when distances do not exceed 500 to 600 km (310 to 370 mi), as airport check-in and boarding procedures may add as many as two hours to the actual transit time. Also, rail operating costs over these distances may be lower when the amount of fuel consumed by an airliner during takeoff and climbout is considered. As travel distance increases, the latter consideration becomes less of the total cost of operating an airliner and air travel becomes more cost-competitive. Some high speed rail equipment employs tilting technology to improve stability in curves. Examples of such equipment are the Advanced Passenger Train (APT), the Pendolino, the N700 Series Shinkansen, Amtrak's Acela Express and the Talgo. Tilting is a dynamic form of superelevation, allowing both low- and high-speed traffic to use the same trackage (though not simultaneously), as well as producing a more comfortable ride for passengers. The Electric Tilt Train, the fastest train in Australia, travelling between Brisbane and Rockhampton in Queensland, a distance of 615km. The distinction between the types can be thin or even non-existent. Trains can run as inter-city services between major cities, then revert to a fast or even regional train service to serve communities at the extremity of their journey. This practice allows marginal communities remaining to be served while saving money at the expense of a longer journey time for those wishing to travel to the terminus station. Regional trains usually connect between towns and cities, rather than purely linking major population hubs like inter-city trains, and serve local traffic demand in relatively rural areas. Higher-speed rail is a special category of trains. The trains for higher-speed rail services can operate at top speeds that are higher than conventional inter-city trains but the speeds are not as high as those in the high-speed rail services. These services are provided after improvements to the conventional rail infrastructure in order to support trains that can operate safely at higher speeds. Mumbai's suburban trains handle 7.24 million commuters daily. For shorter distances many cities have networks of commuter trains (also known as suburban trains) serving the city and its suburbs. Trains are a very efficient mode of transport to cope with large traffic demand in a metropolis. Compared with road transport, it carries many people with much smaller land area and little air pollution. Commuter rail also travels longer ranges compared to rapid transit systems with comparatively less frequency and may share tracks with other trains. Some carriages may be laid out to have more standing room than seats, or to facilitate the carrying of prams, cycles or wheelchairs. Some countries have double-decked passenger trains for use in conurbations. Double deck high speed and sleeper trains are becoming more common in mainland Europe. Sometimes extreme congestion of commuter trains becomes a problem. For example, an estimated 3.5 million passengers ride every day on Yamanote Line in Tokyo, Japan, with its 29 stations. For comparison, the New York City Subway carries 5.7 million passengers per day on 27 services serving 472 stations. To cope with large traffic, special cars in which the bench seats fold up to provide standing room only during the morning rush hour (until 10 a.m.) are operated in Tokyo (E231 series train). In the past this train has included 2 cars with six doors on each side to shorten the time for passengers to get on and off at station. Passenger trains usually have emergency brake handles (or a "communication cord") that the public can operate. Misuse is punished by a heavy fine. Various commuter and suburban train operators (e.g. Sydney Trains, NJ Transit, Paris RER) use double-decker trains. Double-decker trains offer increased capacity even when running less services. Large cities often have a metro system, also called underground, subway or tube. The trains are electrically powered, usually by third rail, and their railroads are separate from other traffic, usually without level crossings. Usually they run in tunnels in the city center and sometimes on elevated structures in the outer parts of the city. They can accelerate and decelerate faster than heavier, long-distance trains. The term rapid transit is used for public transport such as commuter trains, metro and light rail. However, services on the New York City Subway have been referred to as "trains". In the UK, the distinction between a tramway and a railway is precise and defined in law. In Canada and the US, such street railways are referred to as trolleys or streetcars. The key physical difference between a railroad and a trolley system is that the latter runs primarily on public streets, whereas trains have a right-of-way separated from the public streets. Often the US-style interurban and modern light rail are confused with a trolley system, as it too may run on the street for short or medium-length sections. In some languages, the word tram also refers to interurban and light rail-style networks, in particular Dutch. The length of a tram or trolley may be determined by national regulations. Germany has the so-called Bo-Strab standard, restricting the length of a tram to 75 meters, while in the US, vehicle length is normally restricted by local authorities, often allowing only a single type of vehicle to operate on the network. The term light rail is sometimes used for a modern tram system, despite light rail lines commonly having a mostly exclusive right-of-way, more similar to that of a heavy-rail line and less alike to that of a tramway. It may also mean an intermediate form between a tram and a train, similar to a subway except that it may have level crossings. These are then usually protected with crossing gates. In US terminology these systems are often referred to as interurban, as they connect larger urban areas in the vicinity of a major city to that city. Modern light rail systems often use abandoned heavy rail rights of way (e.g. former railway lines) to revitalize deprived areas and redevelopment sites in and around large agglomerations. Monorails were developed to meet medium-demand traffic in urban transit, and consist of a train running on a single rail, typically elevated. Monorails represent a relatively small part of the overall railway field.Almost all monorail trains are using linear induction motors. In order to achieve much faster operation over 500 km/h (310 mph), innovative maglev technology has been researched since the early 20th century. The technology uses magnets to levitate the train above the track, reducing friction and allowing higher speeds. An early prototype was demonstrated in 1913, and the first commercial maglev train was an airport shuttle introduced in 1984. The Shanghai Maglev Train, opened in 2003, is the fastest commercial train service of any kind, operating at speeds of up to 430 km/h (270 mph). Maglev has not yet been used for inter-city mass transit routes. The Bombardier Talent articulated regional railcar. A railcar, in British English and Australian English, is a self-propelled railway vehicle designed to transport passengers. The term "railcar" is usually used in reference to a train consisting of a single coach (carriage, car), with a driver's cab at one or both ends. Some railways, e.g., the Great Western Railway, used the term Railmotor. If it is able to pull a full train, it is rather called a motor coach or a motor car. The term is sometimes also used as an alternative name for the small types of multiple unit which consist of more than one coach. Railway companies often give a name to a train service as a marketing exercise, to raise the profile of the service and hence attract more passengers (and also to gain kudos for the company). Usually, naming is reserved for the most prestigious trains: the high-speed express trains between major cities, stopping at few intermediate stations. The names of services such as the Orient Express, the Flying Scotsman, the Flèche d'Or, the Royal Scot, and the Red Arrow have passed into popular culture. Some of the popular specially named trains in India are: Brindavan Express (Chennai–Bengaluru), Deccan Queen (Mumbai V.T.–Pune) and Flying Ranee (Mumbai Central–Surat). A somewhat less common practice is the naming of freight trains, for the same commercial reasons. The Condor was an overnight London–Glasgow express goods train, in the 1960s, hauled by pairs of "Metrovick" diesel locomotives. In the mid-1960s, British Rail introduced the "Freightliner" brand, for the new train services carrying containers between dedicated terminals around the rail network. The Rev. W. Awdry also named freight trains, coining the term The Flying Kipper for the overnight express fish train that appeared in his stories in The Railway Series books. Airport trains transport people between terminals within an airport complex. Overland trains are used to carry cargo over rough terrain. A freight train (or "goods train") uses freight cars or wagons (also known as "trucks" or "goods wagons") to transport goods or materials (cargo) – essentially any train that is not used for carrying passengers. Much of the world's freight is transported by train, and the rail system in the US is used mostly for transporting freight rather than passengers. Under the right circumstances, transporting freight by train is highly economic, and also more energy efficient than transporting freight by road. Rail freight is most economic when goods are being carried in bulk and over large distances, but it is less suited to short distances and small loads. Bulk aggregate movements of a mere twenty miles (32 km) can be cost effective, even allowing for trans-shipment costs which dominate in many cases; modern practices such as intermodal container freight are aimed at minimizing these costs. The main disadvantage of rail freight is its lack of flexibility and for this reason, rail has lost much of the freight business to road competition. Many governments are trying to encourage more freight back onto trains because of the benefits that it would bring. There are many different types of freight train, used for carrying a huge variety of different kinds of freight, with various types of wagon. One of the most common types on modern railways are intermodal (container) trains, where the containers can be lifted on and off the train by cranes and loaded off or onto trucks or ships. In the US, this type of freight train has largely superseded the traditional boxcar (wagon-load) type of freight train, which requires the cargo to be loaded or unloaded manually. In Europe the sliding wall wagon has taken over from the ordinary covered goods wagon. In some countries "piggy-back" trains or rolling highways are used. In the latter case trucks can drive straight onto the train and drive off again when the end destination is reached. A system like this is used through the Channel Tunnel between England and France, and for the trans-Alpine service between France and Italy (this service uses Modalohr road trailer carriers). "Piggy-back" trains are the fastest growing type of freight train in the US, where they are also known as "trailer on flatcar" or TOFC trains. Piggy-back trains require no special modifications to the vehicles being carried. An alternative type of "intermodal" vehicle, known as a roadrailer, is designed to be physically attached to the train. The original trailers were fitted with two sets of wheels: one set flanged, for the trailer to run connected to other such trailers as a rail vehicle in a train; and one set with tires, for use as the semi-trailer of a road vehicle. More modern trailers have only road wheels and are designed to be carried on specially adapted bogies (trucks) when moving on rails. There are also many other types of wagon, such as "low loader" wagons or well wagons for transporting road vehicles. There are refrigerator cars for transporting foods such as ice cream. There are simple types of open-topped wagons for transporting minerals and bulk material such as coal, and tankers for transporting liquids and gases. Today, however, most coal and aggregates are moved in hopper wagons that can be filled and discharged rapidly, to enable efficient handling of the materials. Freight trains are sometimes illegally boarded by passengers who want a free ride, or do not have the money to travel by ordinary means. This is referred to as "freighthopping" and is considered by some communities[who?] to be a viable form of transportation. A common way of boarding the train illegally is by sneaking into a train yard and stowing away in an unattended boxcar; a more dangerous practice is trying to catch a train "on the fly", that is, while it is moving, leading to occasional fatalities. Railroads treat it as trespassing and may prosecute it as such. ^ "Train (noun)". (definition – Compact OED). Oxford University Press. Archived from the original on 26 May 2005. Retrieved 18 March 2008. ^ "Magnetic Levitation Trains". Los Alamos National Laboratory. Los Alamos National Laboratory. Archived from the original on 8 February 2015. Retrieved 17 September 2014. The electrodynamic suspension (EDS) levitates the train by repulsive forces from the induced currents in the conductive guideways. ^ Atchison, Topeka and Santa Fe Railway (1948). Rules: Operating Department. p. 7. ^ Hydro Kevin Kantola (14 August 2006). "I Hear the Hydrogen Train a Comin', It's Rolling Round the Bend – Hydrogen Cars Now". Hydrogen Cars Now. Archived from the original on 2 March 2010. ^ Johnson, Bob (1 May 2006). "Head-end power". ABCs of Railroading. Archived from the original on 19 February 2015. Retrieved 20 July 2015. ^ "HEP Trainline Configurations in North America". Northwest Rail. Archived from the original on 22 July 2015. Retrieved 20 July 2015. ^ Central Japan Railway (2006). Central Japan Railway Data Book 2006. p. 16. ^ "Overview Of the existing Mumbai Suburban Railway". Official webpage of Mumbai Railway Vikas Corporation. Archived from the original on 20 June 2008. Retrieved 11 December 2008. ^ Sangeeta (24 June 2013). "Difference between Metro and Local Train". www.differencebetween.info. Retrieved 9 February 2018. ^ "Single-decker v double-decker trains: Barry O'Farrell's claim doubtful". ABC News. 11 April 2014. Retrieved 29 March 2018. ^ Ltd., Hitachi. "Linear Motor Driven System : Hitachi-Rail.com". www.hitachi-rail.com. Retrieved 26 September 2018. ^ "Monorail". RailSystem.net. Retrieved 22 October 2018. ^ "Light Railcars and Railbuses – Feature article". Archived from the original on 6 January 2009. Retrieved 9 June 2008. Glancey, Jonathan (2005). "The Train". Carlton Publishing Group. ISBN 978-1-84442-345-3. , 256 pp.